It can still be a shock to some members of the Alliance and Horde to see Pandaren running about our cities. But imagine my reaction upon seeing the ever-so-awesome Misogai of Ner’zhul running about our random heroic in his near-blinding Bloodlust set. You certainly would not miss this Shaman on the battlefield! I think I took somewhere between 20 and 30 screen shots during that random heroic of Misogai before finally asking him to show me more. 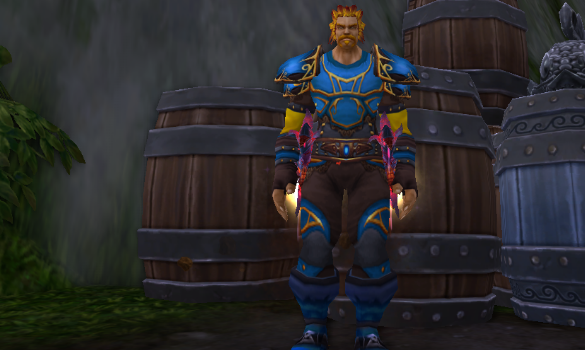 He was kind enough to sit down and show me some of his transmog sets on his other characters, and answer some questions as well. Hi Misogai! 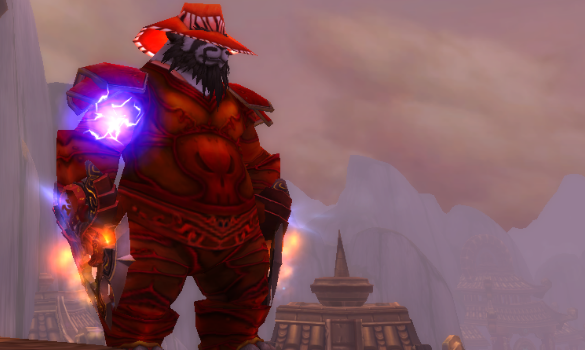 I’ll start by saying when I saw your shamans transmog outfit in our random heroic last week, I loved it right away. Did it take you very long to compile it? Thanks for the xmog love, it’s always nice when someone takes the time to appreciate the time and effort that goes into putting a set together. The set that Misogai is wearing took around 6 months or so to finish. 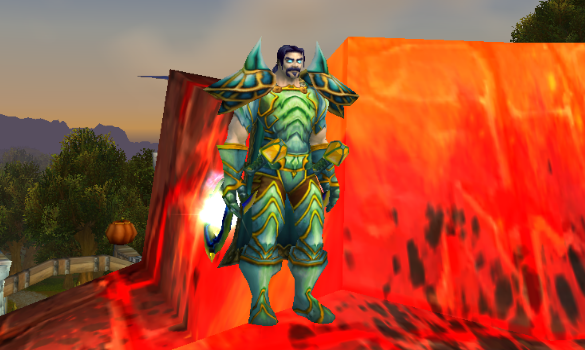 Before transmog became available, did you collect sets before then as well? And if you did, was it just for looks, or do you role play with your characters as well? Unfortunately I did not save much before the announcement of transmogrification came out, I always wanted the space clear in my bags/bank. What’s the longest you’ve spent building one of your sets. They’re not exactly tier items, must have taken some time. I spent about 10 months gathering the glorious set for my Paladin, the legs were the last piece I needed and I finally got them a couple months back. Which of your sets is your favourite, and why? As you can see from my toons I really like sets that drop randomly from mobs as opposed to tier sets. My favorite changes quite often but at the moment I would have to say my warriors Bloodscale set. I recently got the shoulders to drop from Mount Hyjal after 20+ weekly attempts to finish his set off. I guess it means more when it takes so much effort to get. I also love his Very Light Saber weapon xmogs. This one is my second favourite! Are there any hard to get items you’re after right now for a set you’re in the process of making? I am always putting more sets together, and currently I am working on the Vanguard Set for my Paladins dps set. I really appericiate you taking the time to answer some questions and showing us all your sets. 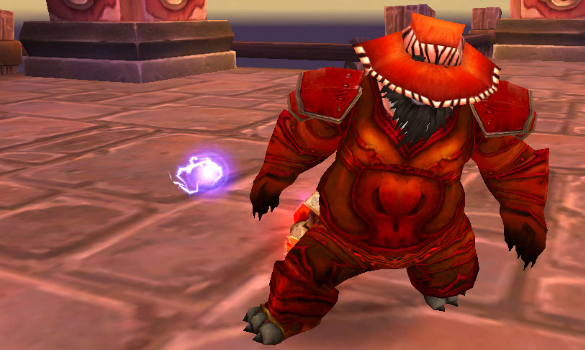 Final question; Is there any advice you’d give to other players looking to delve deeper into transmog? 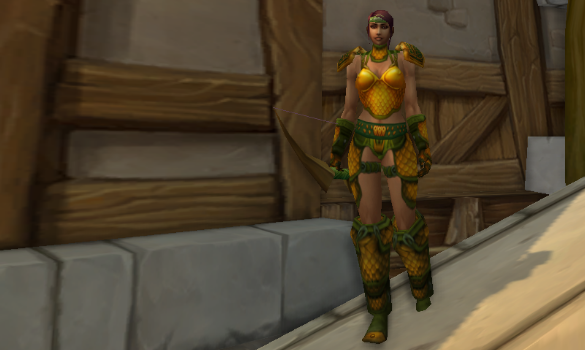 Transmog is a really fun alternative thing to do in WoW. Collecting my sets has been a combination of a lot farming, checking the AH several times a day hoping for that one piece to show up, and finding friends on my realm that are also looking for the same type of items to trade. If you would like to compile one of the sets seen in this post, feel free to leave a comment and I’ll dig a little and get you a list of the items seen. 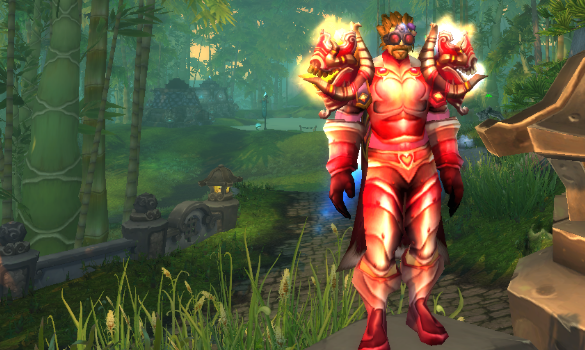 For now however, I will leave you with the raging red armor that is the Stylin’ Bloodlust Set. The level requirement to wear this set is level 70. I remember when he was a dwarf. That is one of my favourite sets! Wow those are some cute mogs! I really like the DK with the Jade set, I have never seen a man use it before and he pulled it off great! Also the panda with the red hat, so cute! What set is the human in yellow and green wearing?